Take a higher perspective and discover the river in a different way! Take a higher perspective and discover the river in a different way! 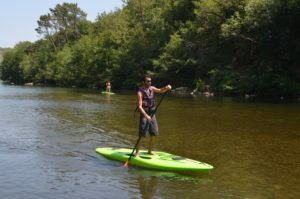 The stand up paddle is a sport which entails rowing standing up using a paddle on a large and wide, flat, surf style board. Easy and fun, accessible to all, helps to keep in shape or to watch the fish in the flat water area! The CCC top tip! Great after 3pm: enjoy the beach on the river side and alternate paddling and swimming!! !